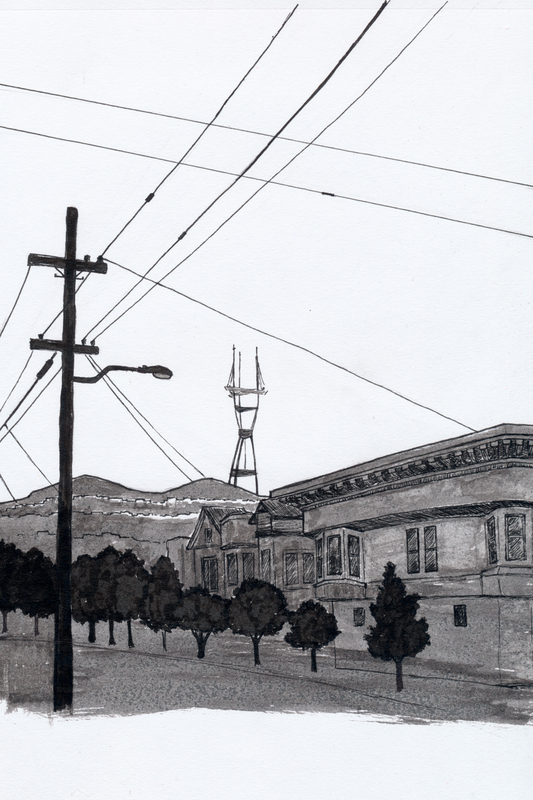 Anyone who lives in San Francisco knows Sutro Tower. Visible from almost everywhere within the city as well as across the bay, this nearly 1000-foot radio tower with its distinctive tripod shape is the locals' landmark. 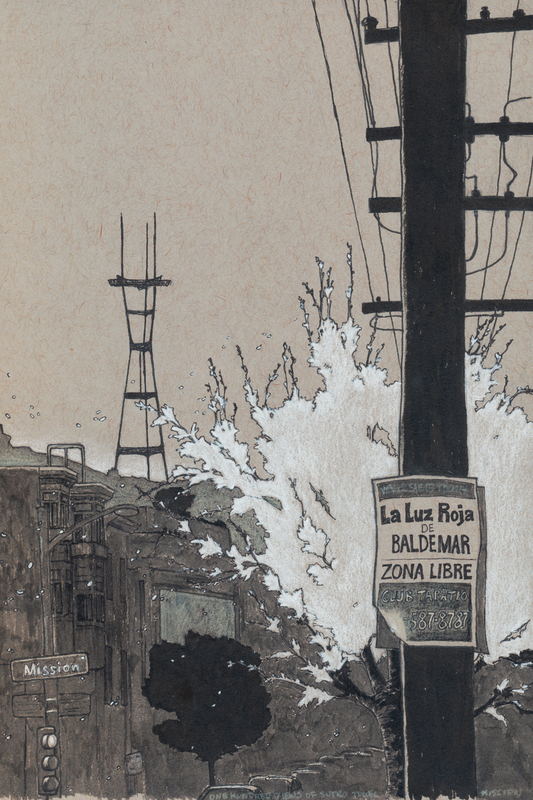 I was introduced to Sutro's charm by my dear friend Erin Badillo, whose love for it runs deep. The tower in panorama from Grand View Park. And after viewing an exhibit on Japanese printmaking at the Asian Art Museum that included a gorgeous copy of Hokusai's One Hundred Views of Mt. Fuji, which shows Fuji-san in all seasons, from different angles, and at different distances, I decided to create one hundred ink illustrations of Sutro Tower. This project will always feel bittersweet to me. I started it at the beginning of what would turn out to be a very challenging year, personally and globally. 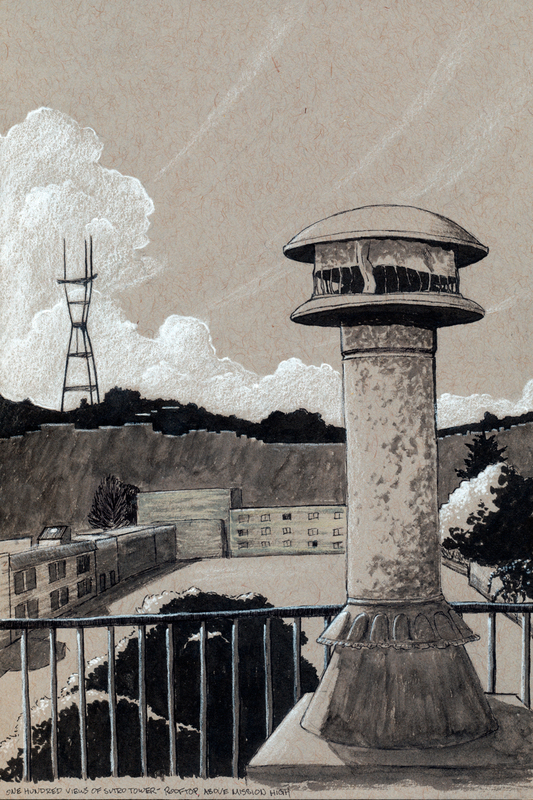 I lived in Noe Valley, with a view of the tower from my backyard. I started drawing on plain white paper, but later switched to gray-toned so that I could use white chalk. Late in the year, I moved to the East Bay, with a very different view. But I can still see the tower on clear days. This project started as a celebration of a favorite landmark, but became a study in ephemerality. This is the view from the roof of the indie games coworking space Gamenest, sadly closed in November of 2017.